Some Republican-led states are rethinking their refusal to expand Medicaid in the aftermath of the failed House effort to bulldoze the Affordable Care Act. Insurers that operate Medicaid plans are seeing dollar signs. But expansion to low-income adults continues to face resistance from some GOP governors, state lawmakers and conservative advocacy groups, who say states can't afford it and it creates welfare dependency. The demise of the GOP repeal-and-replace bill potentially clears a political path for the 19 holdout states to extend coverage to millions of low-income adults. Federal funding for expansion would have been phased out under the House bill, which was yanked by Republican leaders who faced opposition from conservative and moderate members. With expansion funding safe for now, Kansas, Maine, North Carolina and a few other states are weighing expansion of Medicaid. That could provide robust membership growth for managed-care insurers, which are seeing stagnant enrollment in the individual and group markets. If the rest of the states expanded Medicaid, an estimated 7.8 million people would become eligible for coverage, according to the Urban Institute. That would be great for health plans, said Jeff Myers, CEO of Medicaid Health Plans of America, which represents Medicaid managed-care plans that include big Medicaid players such as Centene Corp. and WellCare Health Plans, which sell plans in states that previously expanded. Insurers facing stagnant enrollment in individual and group markets would welcome millions of new Medicaid enrollees, but conservative opposition remains strong. The ACA allows states to expand Medicaid to low-income adults up to 138% of the federal poverty level, with the federal government paying 95% of the cost. The rate would fall to 90% by 2020. Managed-care insurers have thrived under expansion. St. Louis-based Centene served 1.1 million members in Medicaid expansion programs across 10 states last year, compared with just 449,000 in 2015 and 201,300 in 2014, the first year of expansion. Its total Medicaid membership reached 6.9 billion in 2016. Centene's total revenue grew to $40.6 billion last year, up from $22.8 billion the year before. The insurer doesn't break out revenue from its Medicaid business. WellCare, which also deals mostly in Medicaid, grew its Medicaid membership 39% from 1.8 million members in 2013—before Medicaid expansion—to 2.5 million at the end of 2016. Its Medicaid premium revenue totaled $9.5 billion in 2016, up 67% from $5.7 billion in 2013. After the congressional bill was pulled, the Kansas Legislature passed a bill to extend coverage to an estimated 150,000 residents in the first year. But Republican Gov. Sam Brownback, an expansion foe, quickly vetoed the bill, saying it's an “unwise” move when Congress still wants to dismantle the ACA. He criticized the bill for not imposing strict work requirements for eligibility. Lawmakers hope to round up a small number of additional GOP votes to override Brownback's veto, and provider groups are lobbying holdout lawmakers hard. In Virginia, Democratic Gov. Terry McAuliffe is again pushing to expand Medicaid to more than 430,000 low-income residents. Last week he introduced a budget amendment that would give him the authority to expand the program. The state GOP-led Legislature quickly responded with a statement reiterating its opposition to expansion. Georgia, Maine and North Carolina are also eyeing expansion. In Maine, where Republican Gov. Paul LePage has vetoed previous expansion bills, supporters got enough signatures to put the issue up for a binding ballot initiative in the fall. It would cover an estimated 57,000 residents. In North Carolina and Georgia, expansion would extend coverage to an estimated 624,000 and 791,000 people, respectively. North Carolina's new Democratic governor, Roy Cooper, quickly reversed his Republican predecessor's stance and used executive power to expand the program, but Republicans have sued to block his action. In Georgia, Republican Gov. Nathan Deal is seeking a waiver to expand Medicaid with eligibility restrictions. But several red states have embraced Medicaid expansion after seeing that it leads to better health outcomes for low-income residents, less uncompensated care at hospitals, and significant state budget savings, said Deborah Bachrach, a partner at Manatt Health and former Medicaid director of New York. A patient and a provider explain why Kansas should expand Medicaid: In vetoing a bill to expand Medicaid coverage to an estimated 150,000 low-income adults, Kansas Gov. 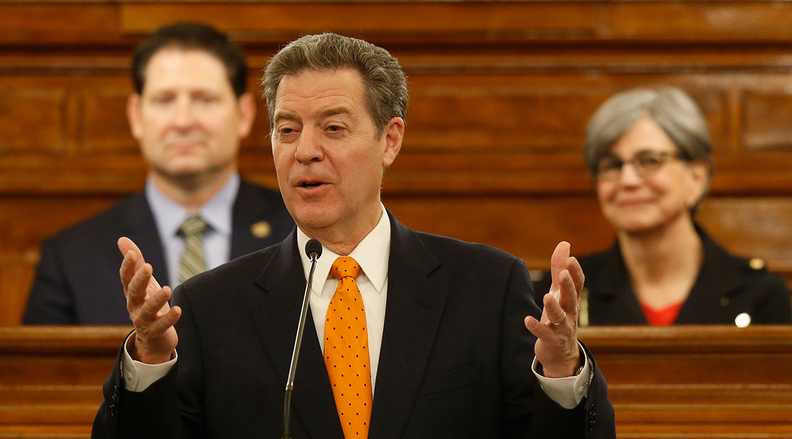 Sam Brownback said that Medicaid should include a strict requirement that all able-bodied adults find a job. Expansion states mostly moved the added beneficiaries into private managed-care plans, Myers said. Those contracts are lucrative. Indiana last year awarded managed-care contracts to Anthem, Centene, CareSource and MDwise. The contracts were worth a cumulative $3.3 billion a year and covered 1 million poor adults and children. Margins on Medicaid business are thin, usually between 1% to 3%, said Deep Banerjee, director at S&P Global. That's because the states and the federal government, which fund Medicaid, have a lot of bargaining power. But “if you can add enough membership and manage the fixed costs going into it, it can be a profitable business,” said Mark Rouck, senior director at Fitch Ratings. There's still a chance that congressional Republicans could make cuts to Medicaid. The failed House GOP bill would have phased out the enhanced federal contribution that finances Medicaid expansion starting in 2020. It would also have converted Medicaid to a capped per capita payment system in 2019. The Congressional Budget Office estimated that the bill would lead to 24 million more uninsured people than under current law. A big chunk of that—10 million—would stem from changes to Medicaid.